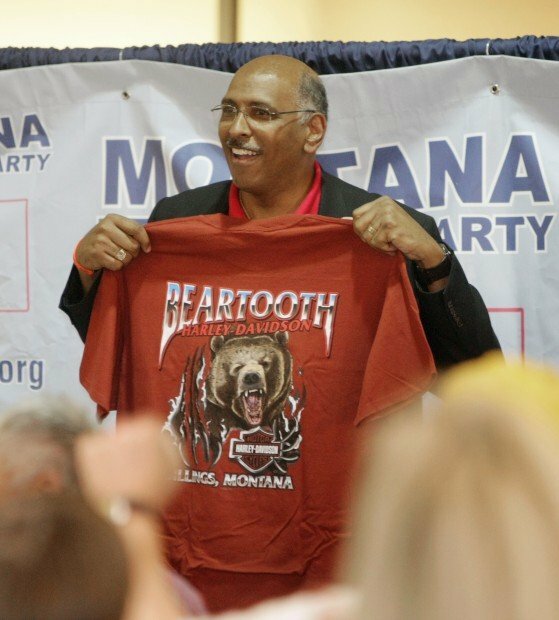 Michael Steele, the Republican National Committee Chairman, is given a Beartooth Harley Davidson t-shirt on Sunday, October 10, 2010 while visiting the Montana Republican Party. Steele arrived in the "Fire Pelosi" tour bus. 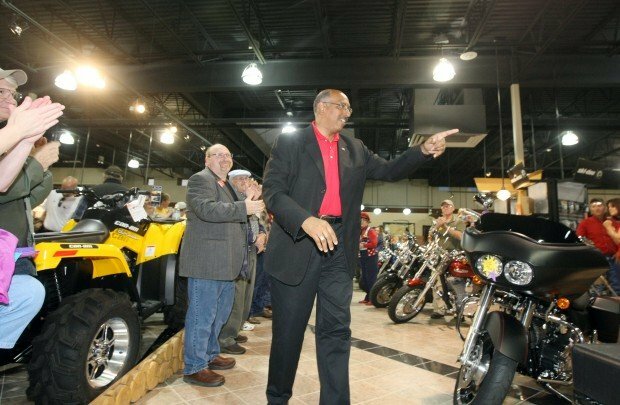 Michael Steele, the Republican National Committee Chairman, arrives at the Beartooth Harley Davidson dealership in Billings on Sunday, October 10, 2010 to speak at the Montana Republican Party. Steele arrived in the "Fire Pelosi" tour bus. The Republican National Committee Chairman Michael Steele is seen in Billings on Sunday, October 10, 2010. Former Montana Governor Tim Babcock and his wife Betty welcome the Republican National Committee Chairman Michael Steele to Billings on Sunday, October 10, 2010. Michael Steele, the Republican National Committee Chairman, greets people after speaking at the Montana Republican Party's barbeque at the Beartooth Harley Davidson dealership on Sunday, October 10, 2010. Cindy Daines responds to the guest speaker, Michael Steele, the Republican National Committee Chairman, at the Beartooth Harley Davidson in Billings on Sunday, October 10, 2010. A young girl in a brown dress posed for a picture in front of a big red bus, painted with white stars and the words “Want Jobs? Fire Pelosi” plastered on its side. Her mother snapped a photo and moved aside as Republican National Committee Chairman Michael Steele emerged from inside to a round of applause from area supporters. The words painted on the side of the bus represented a message Steele has spread across the country with his Fire Pelosi bus tour. The tour began in Sept. 15 with the goal to visit 100 cities in the country’s 48 contiguous states before the Nov. 2 elections. The purpose of the tour is to encourage votes for Republicans in districts across the nation. Local Republican Party representatives, including former governor Tim Babcock, were in attendance for Sunday night’s event, which included a burger and hot dog dinner before Steele’s arrival at around 7 p.m.
Babcock and his wife, Betty, were able to walk around Pelosi’s tour bus prior to speeches. Steele made a previous stop in Montana during the Republican Party 2010 Platform Convention in July separate from the bus tour. Steele’s focus Sunday night was on the small business owner, teacher, doctor and the parents raising families in Montana. He also stressed the importance of influencing the nation’s youths and their ability to share their ideals through social networking. “They are part of an important future that is not going to happen in 40 days from now, but 40 minutes from now when you share your experience from this night,” Steele said. The bus is scheduled for another rally in Rapid City, S.D., Monday afternoon as Steele heads back toward the East Coast. “Times have changed,” Steele said. “People used to get upset, mad and go to the polls or not go at all. This time is different. Contact Chelsea Krotzer at ckrotzer@billingsgazette.com or 657-1392. Photos of Michael Steele, the Republican National Committee Chairman, on the "Fire Pelosi" bus tour.